Paro Festival is one of the most popular festivals in Bhutan. 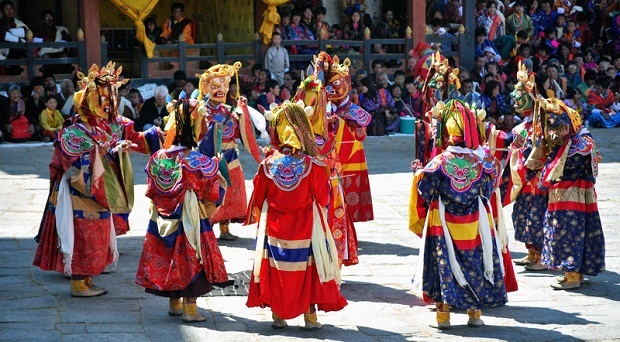 Featuring dances performed by trained monks and laymen in amazing masks and costumes, Tsechus (festivals) are one of the best ways to experience the ancient living culture of Bhutan. A Tsechu is a Buddhist festival in honour of Guru Rimpoche, the saint who brought Buddhism to Bhutan. A highlight of the Paro Tsechu is the unfurling of the silk Thangka – so large it covers the face of an entire building and is considered one of the most sacred blessings in the whole of Bhutan. Later transfer to Punakha across the Dochula Pass (Alt.3050 M). If the weather is clear, you will have spectacular view of the snowcapped Himalayan mountain peaks from the pass. The colorful 108 Chortens on top of the pass is spectacular to look at. Evening visit Mongar Dzong, built albeit quite recently, the Dzong still maintains the architectural traditions followed by a leisure time in town. After breakfast, drive across Kori la pass (2450 Mtrs. ), the place marked by a pretty Chorten and a stone wall. The first part of the journey is through leafy forest filled with ferns. Later road descends rapidly through corn fields and banana groves arriving the famous zigzags of Yadi, which is a recent settlement. About 40 kms onwards lies Trashigang at 1000 Mtrs. Trashigang is center of the biggest and most populated districts in the country. Day excursion to Trashiyangtse, a district that borders to the Indian state of Arunachal Pradesh. Sightseeing includes visit to the temple of Gom Kora, set on a small alluvial plateau, overlooking the river, 24 km from Trashigang. You will continue on down the road to Doksum village, where you can see women busily weaving traditional Bhutanese fabric, and a chain-link swing bridge dating back to the 15th Trashiyangtse is now a rapidly growing town and is famous for its wooden containers and bowls, attractive and handy souvenirs of a visit to this remote region. Later visit Trashiyangtse Dzong, which overlooks the town; continue visit the dazzling white Stupa of Chorten Kora on the riverbank below the town, and the nearby Institute for Zorig Chosum, where students are trained in Bhutan’s 13 traditional arts and crafts; evening drive back to Trashigang.